We acknowledge hockey great, businessman and philanthropist, Dr. Herbert H. Carnegie, who dealt with several obstacles in his hockey career, but transformed his incredible life to an outstanding legacy. Born in Toronto, Ontario, to Jamaican immigrants, Herbert Carnegie fell in love with the game of hockey at an early age, playing on the frozen ponds in north Toronto and listening to Foster Hewitt call the play-by-play on the family's wireless. Mr. Carnegie, along with his brother Ossie, played in Ontario’s junior league and Quebec Provincial semi-pro league. Herb Carnegie played center position and was known as a playmaker. 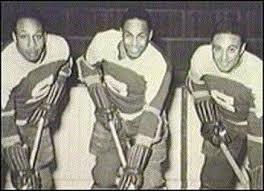 During the Buffalo Ankerites 1941 season, the team was the first semi-pro organization to have an all-Black line; Herb Carnegie, his brother Ossie, and Manny McIntyre. Their explosive line was nicknamed “Brown Bombers”, “Dusky Speeders”, “Dark Destroyers”, ultimately becoming known as “Les Noirs” or the “Black Aces”. Herb Carnegie during his 1947-1948 season with the QPHL Sherbrooke St. Francis scored 127 points (48 goals, 79 assists) in 56 games. His hockey career spanned the 1940s and 1950s in the QPHL, QSHL and OHASr, “a dazzling smooth skating center who won several MVP trophies over the years”, but was forced to give up his dream to play in the NHL. Carnegie played 520 semiprofessional games, scoring 272 goals and 391 assists for 663 points… he was a trailblazer for those to follow. Dr. Herbert H. Carnegie had received numerous awards; community and service recognition; media and special recognition, including and not limited to: Order of Ontario 1996; Canada’s Sports Hall of Fame 2001; Order of Canada 2004; Honorary Chief of Police for York Regional Police 2005; and Honorary Doctor of Laws - York University 2006. Dr. Carnegie touched many individuals during his lifetime and left a legacy on how one “can be empowered one’s self to make choices that can make this world in a better place.” We are honored to have Bernice Carnegie as a supporter of our mission. Dr. Carnegie was featured as a real-life comic book character in three special issues of Marvel Comic's Spiderman in 1990? These special issues were done in conjunction with the Canadian Association of Chiefs of Police of a positive lifestyle message featuring the Future Aces Philosophy.